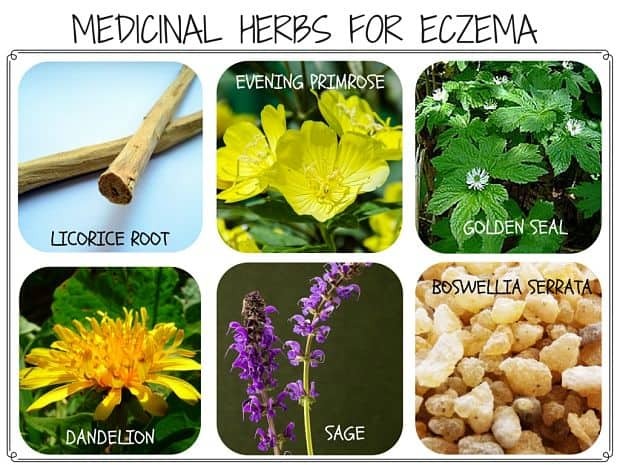 Medicinal herbs for eczema treatment focus primarily on the underlying causes, as most herbal practitioners view eczema as a symptom of not only one but rather numerous other health-related ailments. There are many medicinal herbs for eczema that have a great reputation as a treatment but which one to choose will vary depending on the underlying cause. Causes such as allergies, food sensitivities, stress, poor digestion, sluggish liver, and bowel function and nutritional deficiencies can all contribute to an outbreak of eczema. Herbal remedies for eczema will usually both involve herbal preparations topically to ease any discomfort and internally to treat the underlying causes. Topically, herbs for eczema will usually combine antiseptic herbs and herbs that soothe the inflamed area. Internally, herbs for eczema treatment will mostly address digestion with a focus on improving the function of the liver and the gut wall to boost the body’s natural absorption and elimination by improving the digestion. Boswellia resin has anti-inflammatory and analgesic properties. The active constituents, boswellic acids, reduce the formation of inflammatory leukotrienes. This resin is often indicated in the natural treatment of many inflammatory conditions including eczema. By supporting adrenal function, licorice may help in improving energy levels and general well-being during times of stress. In addition, licorice is also a mild laxative that supports digestion. Licorice root is also an effective anti-inflammatory herb that will sooth eczema from within. Topically, sage is an effective antipruritic (relieves itching), and often combined with soothing herbs, such as marshmallow that helps to relieve irritated and itchy skin. A good topical herbal preparation will also have antiseptic and anti-inflammatory herbs as part of a total skin preparation to ease the symptoms of eczema. Golden seal is an effective topical antibacterial agent, mainly due to its berberine content. When used in combination with marshmallow to soothe inflamed skin it will reduce inflammation. Internally, golden seal has historically been called the “King of Tonics”, and is used as an antibiotic and liver tonic. This herb will increase bile production which acts to detoxify the body by increasing elimination. Evening primrose oil (EPO) is high in an essential fatty acid, called gamma linoleic acid (GLA) and is a very effective anti-inflammatory herb that, like licorice, will soothe the gut and eczema lesions as part of a total approach to treating eczema. These herbs are referred to as “blood purifiers”; working to improve digestive function by increasing bile output from the gallbladder into the small intestine. Many traditional herbalists will prescribe these herbs for eczema together as an overall tonic for the liver and gallbladder. Blood purifiers are also referred to as restoratives where they assist the body in healing itself and addressing the underlying cause of many conditions, including eczema, dermatitis and acne. Secondly, these blood purifying herbs are thought to improve the quality of digestions and efficiency of the digestive system and in combination with a low allergy diet to decrease the absorption of allergens from the diet and increase the quality of what is absorbed. Other natural herbs for eczema. Medicinal herbs for eczema work best when combined with a high fiber, low allergy diet. For people afflicted with eczema, chances are that the digestion and liver function are not working at their optimum. It is often recommended to drink a minimum of eight glasses of filtered water a day and take a supplement containing zinc, vitamin C and E in a formula specially designed for those suffering from eczema.